Hi guys! Tis the season for football, amiright?! Do y’all have football-crazed family members getting super excited as the season draws to a close, whether their team is still “in it” or not? Does every conversation in your house seen to turn into a debate about player stats and team records? Are you finding your normally cozy and quiet family room turn into a man cave every Sunday afternoon? Please say it’s not just me! We usually end up going to watch the Big Game at a friend’s house, but I know my husband has always wanted to take a turn hosting to party at our house. Secretly, so have I. Today I’m sharing some delicious dips and dippers to make your Big Game party a Super Snack Showdown. Sweet vs. Spicy. Hot vs. Cool. Savory vs. Sweet. Which one will be the MVP of the buffet table? It’s time to find out! I’m a sucker for a good dip, so this buffet table is like my dream come true. Four of my absolute favorite dips along with all the yummiest dippers – ,Snyder’s of Hanover® Pretzels, Snack Factory® Pretzel Crips®, Late July® Tortilla Chips, and a variety of crunchy Cape Cod® and Kettle Brand® Potato Chips. Bonus: a sweet nutty Pop Secret® Popcorn treat with Emerald® Nuts to top it all off! I’ll share all my recipes below. You could ask your guests to bring their favorite football snacking food or dippers as well for even more variety. This was the “Before” photo. My guys would have been fine if we had just left it at that, but they were OK with me decorating as long as it was not “too cute” or “over the top” – their words. I feel like we found a happy medium with this stadium-inspired spread. I found an artificial turf rug online for about $10 and decided it would make the perfect table cover. Then I added a couple of risers made from 1x6 pine boards and molding pieces to give the feeling of bleachers. This gave me some different levels for food display and made it all look a little more interesting! To really define the area, I hung a sheet of black butcher paper on the wall behind the table and drew a football play diagram on it in chalk. I wanted to add some color so I chose bright primary colors and made tissue paper tassels to hang along the wall as well. They look a little bit like pom-poms which is a fun touch. You could use your favorite team’s colors or even the colors of the two opposing teams on opposite sides of the table. Instead of plates, I decided to use cardboard take-out boxes as trays. I simply cut off the top flaps since we did not need them to close. They reminded me of the way food is packaged in a stadium. I figured our guests could fill up their tray with chips and dips, grab a bottle of rootbeer and take it with them back to the living room to eat. Since no one wants to be away from the game for too long, I pre-portioned all the dippers into small bags and cups to make them easy to grab-and-go. The dips are easily spooned into small cups and placed into the trays along with the dippers. I also placed a tray of extra dippers on the coffee table so guests could refill without getting up. You know how annoying it is when you need just one more pretzel to finish your dip. Problem solved! I used the pennants I shared yesterday to label the dips. Just tape the pennant flag to a straw or bamboo skewer and pop it right into the bowl. I tried to have a good variety of hot and cold, meat and veggie, etc. – SPICY Chorizo Queso, SWEET Salsa Verde, HOT Parmesan Artichoke Dip, and COOL Shrimp Dip. I was hoping there would be something everyone would enjoy! You could even throw in a veggie tray with some dill dip. My guys tend to like the “heartier” choices. I also felt like we needed a sweet treat for dessert, so I made a batch of toffee popcorn, drizzled with melted white chocolate and sprinkled with Cocoa Roast Almonds, which look like tiny little footballs. My oldest son could not get enough of it!! I wanted a wide variety of yummy, high-quality dippers for my dips. I found them all at my local grocery store – some in the “natural” section and some in the snack aisle. All you have left to do is make the food, so let’s get cookin’, Good Lookin’! 1. Pop the popcorn and remove all unpopped kernels. Place in a large bowl. Heat butter, corn syrup, and brown sugar in a saucepan over medium heat. 2. Stir mixture constantly until boiling. 3. Remove from heat and stir in baking soda. This will make the mixture "frothy" and help it to coat the popcorn more easily. 4. Pour hot toffee mixture over popcorn and stir to coat evenly. Spread popcorn onto two baking sheets and bake at 250 degrees for 20 minutes, stirring midway. Remove from oven and spread out on parchment paper to cool. 5. Melt white chocolate chips in a bowl in the microwave. Drizzle half of the white chocolate over popcorn. Sprinkle almonds on top of popcorn and white chocolate, then drizzle again with remaining melted white chocolate. Allow to cool until white chocolate hardens again. Break into small clumps and serve. 2. Blend until smooth and serve with corn tortilla chips. Follow the dip version of the recipe here. My mom's classic recipe is here. In a microwavable bowl, combine cubed cheese and tomatoes with green chiles. Microwave on HIGH in 45 second increments, stirring in between, until cheese is melted. Place in a small crock pot on warm setting to keep warm. Cook chorizo in a frying pan until cooked through. Stir into melted cheese and tomato mixture and serve for a spicy twist on the classic queso. Do you usually host the big party or do you watch at a friend's house? Either way, these recipes are sure to be crowd-pleasers no mater what the final score of the game is. Enjoy the end of the football season, friends!! Hi guys! Today I wanted to share a really simple and fun craft idea with y’all. This seems to be the season of football. All the Christmas trees and candy canes of last month have been replaced with Astroturf and team mascots. I created a fun paper pennant pattern you could use to make a vintage-style sporty bunting or buffet labels for your next football or sports themed party. I bought a bunch of cardstock and patterned papers in a variety of bright colors. You could use your favorite team colors or the colors of the opposing teams if you are making it for a Super Bowl party. I used my Silhouette to cut the pieces out to save some time, but you could cut them by hand if you don’t have a cutting machine. Glue the decorative paper pieces on top of the solid cardstock pieces to form each individual pennant. You could also attach them to a string to make a bunting and hang it up. Download the pdf pattern here to cut pennants by hand. Download the SVG cut file for the background piece here. Download the SVG cut file for the top piece here. Download and cut both files to create flags. Have fun celebrating your team this season, friends! Be the "Hostess with the Mostest" when you serve these delicious Garlic Parmesan and Sweet & Spicy Tyson® Crispy Chicken Strips at your Playoff party! You can sit and enjoy the game instead of slaving in the kitchen, and no one needs to know how easy they were to make. Hi guys! With the holidays now behind us and a brand new year stretching out ahead, it's time to start thinking about what to serve your friends and family while they watch the Big Game this year! I've got you covered with a couple of SUPER simple recipes for THE MOST delicious Tyson® Crispy Chicken Strips on the planet. Seriously, these Tyson® Crispy Chicken Strips taste so good your friends will wonder where you ordered them from! The best part is, you can set the whole spread up ahead of time, which means you can actually sit and enjoy the game, too. I'll admit, I'm a little bit picky when it comes to football party food. I love the chicken wing joints offer, but I prefer Tyson® Crispy Chicken Strips because they're easier, and wayyy less messy, to eat. That's why I have come up with a way to recreate my favorite wing flavors at home! I picked up a couple of bags of Tyson® Crispy Chicken Strips (3.5 lbs) and a bag of Tyson® Boneless Wyngz (3 lbs) Honey BBQ flavor last time I was at Sam's Club so I would have enough delicious chicken to feed an army of hungry football fans. Visit Ibotta to earn yourself a little cash as well. Winning!! My favorite wing flavors are Garlic Parmesan, Sweet & Spicy (a sweeter version of traditional Buffalo wings) and Honey BBQ. Since Tyson® Honey BBQ flavored Boneless Wyngz are already perfection, there was no need to reinvent the wheel there -- just heat and serve! I came up with the perfect way to add Garlic Parmesan and Sweet & Spicy flavors to the Tyson® Crispy Chicken Strips by dipping them in delicious glazes after they come out of the oven. They are the perfect centerpiece for a fun football food buffet all decked out in your favorite team colors. Our favorite team barely made the playoffs this year, but we didn't hesitate to show our spirit and cheer them on in style!! Start with a simple backdrop. I didn't have a neutral enough area in my dining room so I just hung loosely draped white plastic table cloths on the wall to define the serving area. Then I added a few paper lanterns and tissue paper pom-poms in a mix of fun patterns and colors. (Party hack: I used paper napkins to create the solid blue and the polka dot pom-poms!) In case anyone was confused about what we wanted the result of the game to be (ha, ha), I added gold mylar balloons spelling out WIN. A green plastic tablecloth on the table mimics the green of the football field turf. To carry on the stadium theme for my party table, I built a few simple risers out of 1x6 pine boards and molding pieces. They're barely noticeable on the table, but they make the display so much more interesting to look at and give you the feeling of bleachers. I picked up a variety of vintage style glass soda bottles in our team colors for guests to drink. You can find lots of paper straws and bags in different colors and patterns at any party supply store. I cut down the tops of some blue lunch bags, making them the perfect size to hold single servings of chips. The black and white referee-stripe cups are great for holding queso or salsa for dipping. We also offered some spicy ranch pretzels in little polka dot paper bags. Buttered popcorn would also be fun in small bags. Serve a variety of yummy snacks and your guests will be thrilled. Place the stars of your snack table -- the Tyson® chicken-- in galvanized metal containers lined with leaf lettuce, add a couple veggie trays and dips, and you're all set! Just make the chicken strips right before guests arrive so they'll be piping hot and you can enjoy some of the snacks (and the great company) without being tied to the kitchen all night. Cook chicken strips according to package directions. While chicken is cooking, melt butter in a small sauce pan. Add garlic powder and parsley, stirring until combined. Dip each chicken strip in the warm garlic butter and place on a baking sheet. Sprinkle a generous amount of Parmesan cheese on both side of each chicken strip. Transfer to serving tray and serve while warm. Heat hot sauce, brown sugar and water in a saucepan over medium heat for several minutes until sugar is completely dissolved. Place in refrigerator to cool. You want the sauce to be nice and cool so it thickens up a bit and really clings to the chicken strips. While sauce is cooling, cook chicken strips according to package instructions. Dip each chicken strip into the cooled sauce and place on a baking sheet. Transfer to serving container when ready to serve. Serve warm. Combine all ingredients in a bowl and whisk together until smooth. Allow to set up in the refrigerator for several minutes before serving. It will be very runny until it sets. This dipping sauce is fantastic with all three flavors of chicken and makes an awesome dip for veggies, as well. Make your Game Day party a win with these delicious recipes and easy decor ideas next time your team hits the field! What's your favorite game day snack? Share it in the comments! This year I created a memory calendar that looks more like a list than anything else. I plan to hang it on our fridge or by our desk so it is handy all the time and I can write down cool things that happen each month – awards the kids get in school, fun little family outings, and simple memories that make me smile. Then, in December, I can pull it out and have a wealth of ideas to add to our letter. I can also tuck it in the back of my journal and have all those beautiful memories preserved forever. This year my personal goal is to become more aware of the blessings in my life. 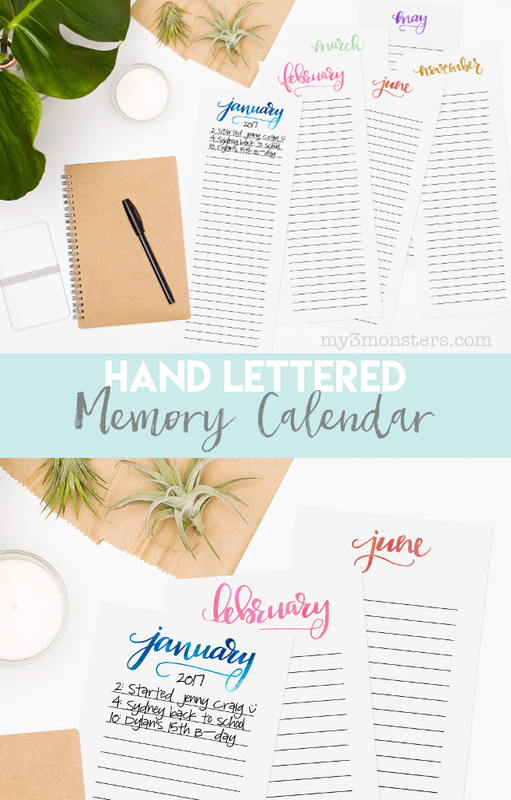 I will also print a copy of this memory calendar just for myself so I can record all the little blessings that come daily – those tender mercies from my Heavenly Father that he gives to bring us joy and help us along the way. I feel like if we are more aware of those things, and try harder to recognize and record them, they will come more and more frequently. 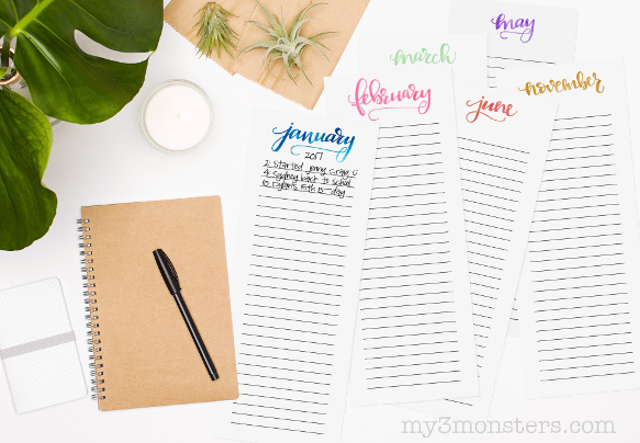 This memory calendar is designed to be printed on 8 ½ x 11 cardstock – two months to a page. 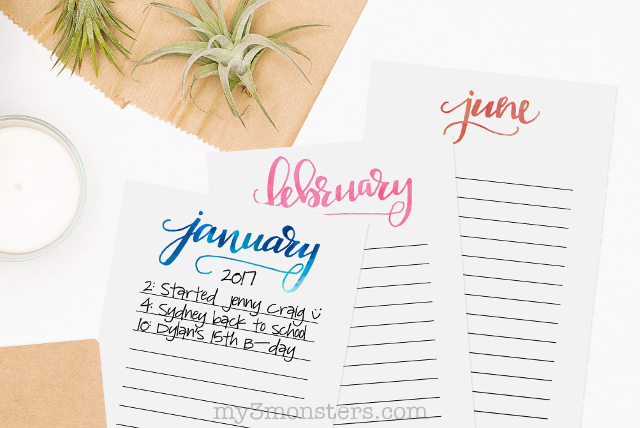 Download the printable file here. Simply cut each page in half lengthwise and clip them together with a pretty binder clip. It is seriously the easiest project EVER!